Looking for a job in Delaware County Indiana? 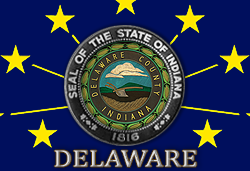 This Delaware County Indiana job guide is a resource for job seekers looking for legitimate employment opportunities in the region with an emphasis on government positions, top healthcare employers, public school careers, and major job boards. Delaware County Indiana periodically posts job openings. Open positions found on this review date had included Sheriff Secretary, Diesel Mechanic, Truck Driver, Security Bailiff, Case Manager, Adult Probation Officer, Clerical Job, 911 Communications Tech / Emergency Dispatcher Job, and Home Detention Surveillance Officer. Check their site for the latest listings. Muncie Indiana had a Muncie Veteran Program Application (available for qualified BSU students for a one month project employment). There had also been openings for Substitute Crossing Guards. Indiana University Health Ball Memorial Hospital is the largest non-government employer in East Central Indiana, employing nearly 3,000 people. This not-for-profit organization boasts a clinical staff of more than 400 physicians, representing more than 45 medical specialties. Open positions found had included Respiratory Therapist, Registered Nurse Pre-Admission Testing, Admissions Coordinator Inpatient Rehab, Cardiac Sonographer Tech, Respiratory Therapy Instructor, Certified Medical Assistant CMA, Registered Nurse RN Observation Unit, Registered Nurse Medical Telemetry Unit RN, Full-time Registered Nurse RN, Nurse Practitioner Cardiac Stress Testing, Emergency Medicine Nurse, Emergency Physician Assistant, Registered Nurse Medical Telemetry, Dermatologist, BC/BE General Anesthesiologist, Nurse Practitioner Primary Care, Nurse Practitioner Neonatal, and Nurse Practitioner Behavioral Health. Open Door Health Services is a not-for-profit, Federally Qualified Health Center, providing comprehensive primary, urgent, and preventive healthcare services to individuals and families throughout East Central Indiana. Here positions were available such as Medical Assistant, Patient Care Representative, Adult Physician, Adult Family Medicine Physician, Chief Medical Officer, Clinical Quality Coordinator, Dietitian, Family Medicine Physician, Medical Assistant Family and Child, Navigator Certified Assistance Counselor, Nurse Practitioner Urgent Care, Pediatrician, Postdoctoral Fellow Psychology, and Wellness Coordinator. Community Hospital Anderson is part of the Community Health Network. Open positions found had included Home Care Physical Therapist and Licensed Practical Nurse. Concentra was founded in 1979 and has grown to be the largest provider of occupational health care services in the country. Albany Health and Rehabilitation Center provides a spectrum of rehabilitation services and 24-hour nursing care. Here open positions were found such as Certified Nursing Assistant CNA, Registered Nurse RN, Licensed Practical Nurse LPN, Dietary Aide, Housekeeper, and Nursing Assistant Trainee. Signature HealthCARE offers long-term care, rehabilitation, and healthcare services at 148 locations in 11 states and employs over 22,000 staff network wide. Past jobs found have included Assistant Director of Nursing RN Muncie, Licensed Nursing Jobs, RN for Skilled Nursing and Rehab, Licensed Nursing Home Administrator, RN All shifts, Quality of Life Assistant, CNA All shifts available, Dietary Aide, LPN FT all shifts available, and Part time Cook. Bethel Pointe Health and Rehabilitation Center's jobs included Activities Assistant, Certified Nursing Assistant CNA, and Registered Nurse RN. The Woodlands provides physical, occupational and speech therapy on an inpatient and outpatient basis with secured Alzheimer's and dementia units. Openings available had included Registered Nurse RN, Certified Nursing Assistant CNA, LPN, Registered Occupational Therapist, and RN Unit Nurse. Delaware Community School Corporation has ongoing employment opportunities. A survey of open positions found on this review date had included High School Industrial Tech PLTW Teacher, Middle School Counselor, Middle School Science Teacher, Middle School Math Teacher, Elementary School Teacher, School Custodian, Coaching Jobs, and School Bus Drivers. Cowan Community Schools openings found had included Special Education Aide, Media Center (Library) Aide, Groundskeeper, Student Summer Helper, Custodial/Light Maintenance, Substitute Bus Driver, and Substitute Cafeteria Worker. Daleville Community Schools consists of Daleville Junior / Senior High School and Daleville Elementary School. Positions available on this review date had included Assistant Volleyball Coach, Head Varsity Boys Basketball Coach, and Corporation Treasurer. Liberty-Perry Schools was hiring. Positions had included Technology Integration Coach, High School English Teacher, School Secretary, Teacher Aide, and Custodian. Muncie Community Schools had a number of employment opportunities posted on this review date. Open positions had included Chief Financial Officer, Wrestling Coach, Cheerleading Coach, Security Guard, Substitute Teacher, Adult Education Aide, Creative Child Care Aide, Camp Adventure Activity Leaders, Elementary Teacher, Art Teacher, Early Childhood Teacher's Aide, Bus Driver, Special Education Aide, Instructional Assistant for Alternative Education, Title I Instructional Assistant, Elementary School Secretary, Social Studies Teacher, Dual Language Elementary Teacher, Elementary Teacher Long Term Substitute, Science Teacher, Math Teacher, Kindergarten Teacher, Special Education Teacher, Adult Education Teacher, and Guidance Counselor. Wes-Del Community Schools consists of an elementary and middle school / high school. Wes-Del Community Schools were originally formed in 1964 by the consolidation of Harrison and Washington Townships. Educational excellence is well noted in the success of academic teams that begin at the elementary grades and continue through the secondary grades. Students are also provided vocational education opportunities through the Muncie Area Career Center. Yorktown Community Schools consists of two elementary schools, a middle school, and high school. The district hires a variety of teaching and support staff through announcements posted on their employment portal. With about 3,000 full-time employees, including tenure track and contract faculty; professional personnel; clerical, technical, and managerial staff; and service personnel, Ball State is one of the Muncie area's largest employers. Here you'll find faculty and support staff employment opportunities. The Muncie-Delaware County Chamber of Commerce is a good resource for identifying businesses in the region. Their membership directory is a categories and searchable database of businesses with addresses and phone numbers. Muncie Mall periodically posts full-time, part-time, and seasonal positions. Openings may include jobs such as Sales Associate, Maintenance Technician, Store Manager, Loss Prevention Jobs, Customer Service Jobs, and more.